Probably most everyone who has ever been exposed to the Bible or Christianity in some form knows what is meant by "The Sermon on the Mount." It is, undoubtedly, Jesus' most famous discourse. As recorded in Matthew's Gospel, the Sermon on the Mount, as it is popularly called, takes up chapters 5 through 7, and uses about 2,000 words to convey truths related to kingdom living. A very slow reader can make it all the way through these chapters in about 25 minutes. A preacher, using his best preaching voice with inflection and dramatic pauses, will take about the same length of time. And, this discourse is called a sermon. If it was indeed a sermon, then why is it not emulated in our pulpits today? Considering that this was presented by the greatest preacher and expositor of Scripture of all time, why do we not follow His example? Let's do some "reverse engineering" to see how Jesus measures up to our standards. Now, before you take these thoughts and begin to beat your local preacher up with them, let's understand something. "Sermon" is a man-made designation for this talk. It is not necessarily a biblical concept for this, or for any other lengthy recorded talk in the Bible. We would do well to get rid of this particular title, especially if we demand sermons follow a certain pattern. As long as you are able to understand that the title "Sermon on the Mount" is simply a convenient way to classify the recorded speech of Jesus from Matthew 5-7, then there should be no problem. This section of Matthew's Gospel records the first major teaching of the Master, which turns out to be an introduction to His concepts for Kingdom living. We were already told by Matthew that Jesus went about "...preaching the gospel of the kingdom..." (Matt. 4:23). 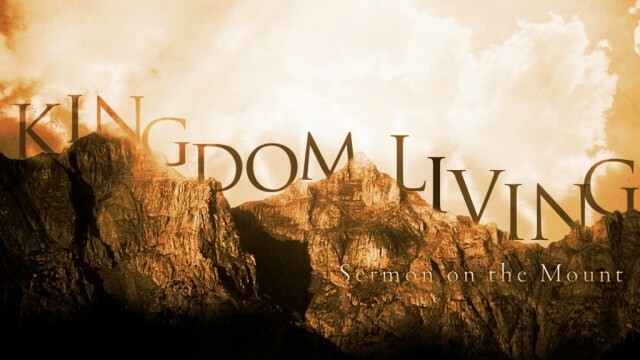 "Kingdom" is a key concept in this gospel. The word 'kingdom' appears 50 times, and the phrase 'kingdom of heaven' shows up 30 times. As we begin our study of this section, we will begin to see very clearly how Jesus' teaching went completely contrary to the understanding of His day, and continues to do so in our day. Any carnal, or humanistic thinking that still resides within your being will be sorely challenged in this study. Kingdom principles are consistently at odds with normal human thinking.